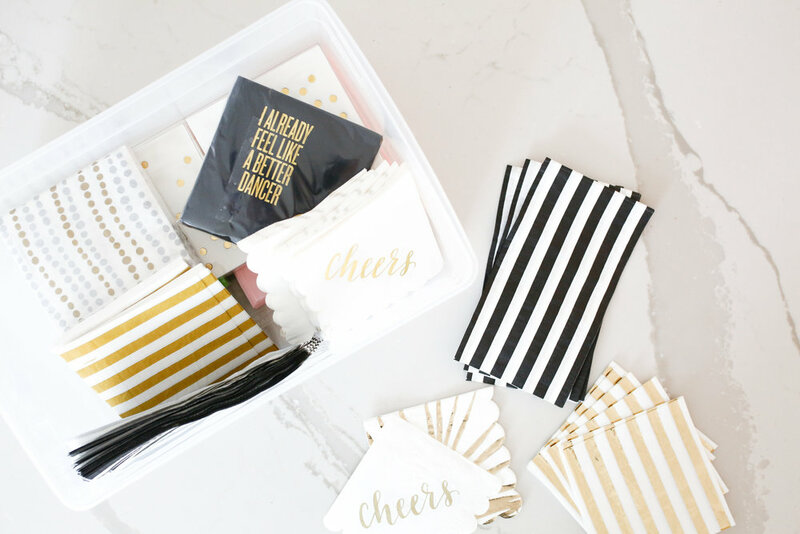 Continuing on with our new year, new you theme we have going on this week, I wanted to talk about purging and organizing your home. Many of you saw me go on an absolute cleaning and purging marathon over on Insta-stories and were curious about how I did it. Today I wanted to share some of my tips and tricks for purging and organizing your home and show you some of the spaces that I worked on over the holiday break. I typically go through periods where I let the house go and become a total wreck and then basically freak out and go on a purging and organizing rampage. I become a woman on a mission who can not be stopped until every space is clean + organized. Like most of you, that typically happens for me right after the holidays are over , and I start taking down the Christmas decorations. This year I got a jump start on it because we were moving in to the closet right around Christmas. What started out as a closet purge turned in to a whole house purge. I truly believe that your home should be a sanctuary. This world is chaotic enough; our schedules are packed to the brim and we are all frequently overwhelmed. When I walk through the doors to my home I want to leave all of that chaos outside and come in to a nice calm, clean space. Having my home organized and neat is very much something I do for my mental health. I know that sounds weird, but if my house is disorganized and in disarray it truly creates a sense of uneasiness and anxiety that I can not shake. No one wants to feel like that in their own home. I am going to talk about self-care later this month, and I know this is not something that is typically thought of as self-care, but for me having a clean and organized space is very much about self-care. I am not a professional organizer, and a lot of the things I do or am going to tell you are not things you haven't possibly heard before; however, these are some of the general tips and tricks that work for me. Research a worthy organization and donate your unwanted items. A lot of people were really concerned when they saw the dumpster and were afraid that I was just throwing everything out. Don't worry, I wasn't! I went through everything and created a donate pile to take everything that was still usable and in good condition. I always donate to our local Goodwill because it is convenient and they come and load everything out of my car. However, if you have specific or specialized items, I always think it is a great thing to find organizations that could really need or use your items. For instance, if you are done having kids and are looking to donate some of your baby items, look for a local homeless shelter that specializes in mothers with newborns or babies. One of my girlfriend's churches has a foster care closet that they run where foster parents can come and pick out childern's clothes for their foster kids for free. If you have a lot of work clothes look into organizations like Dress for Success and if you have a lot of formal wear you are looking to get read of check out organizations like Becca's Closet that give prom dresses to underprivileged teens. Get your kids involved- This is an especially big component in our house because my kids are older and understand the concept of cleaning out and organizing. This can be harder when they are younger and don't understand why you are "taking" their things, but I still think it is an important lesson to learn. I send each of my kids up with a couple of garbage bags and make them go through the same process I do with my things. If it is trash, broken, missing pieces, etc it goes in the garbage bag. If it is something that they think another child would like to play with or wear, it goes in the donate bag. Simple as that. I will then come along behind them and help them if I feel like there is still work that needs to be done or I need to see them in clothes to know whether they fit or not. Control sentimentality- A lot of you wanted to know how I control all the paper clutter that my kids bring in; which is especially difficult when they are younger. I have a benchmark I use when I am deciding what to keep and what to toss of my kids...because Lord knows I can not keep every scribbled on piece of construction paper they ever created. I look at each piece and ask myself if this is something that their kids would like to see when they come over one day and we get that bin down from the attic. For instance, does it show their handwriting when they were in Kindergarten, is it a picture or story about what they wanted to be when they grew up, is it a hand print to show how little they once were, etc. Those pieces that give us all a glimpse into who they were or what they were thinking when they were a certain age are the pieces that get to stay. I also keep report cards, tests or papers that they worked really hard for, and homemade Mother's Day/Father's Day gifts. If you have a big job, get a dumpster. I know this sounds extreme, but you would be surprised how much junk/trash you have lying around your house, especially when you start getting your hands on your attic, basement, and garage. We have moved 9 times and I realized when I was putting away our Christmas decorations this year that I had moved around a box of broken ornaments with us through the years. WHY LANDYN!?! So, I went through everything and if it couldn't be re-purposed or donated, I trashed it. I am talking a Christmas tree that's lights no longer worked, broken toys, empty boxes to TVs and electronics we don't even own anymore, even a random couch cushion. My friend told me about Red Dog Dumpsters and now I'm completely hooked. You are able to rent a dumpster by the week and they come to your house deliver it and then you just call them when you are done with it and they come pick it up. If you are in the Nashville area, my LANDYN10 code for 10% off is still good through January. I wanted to share a few tips of mine that were specific to the areas I really focused this year. Let's start with the basement. I am so lucky because the brilliant woman who lived here before me built a storage room in the basement that was lined with shelves all around the room. This has been a godsend and has created a great opportunity for organized storage space. This space is very accessible to our kitchen and so this is where I store the majority of my entertaining supplies- dishes, napkins, party supplies, you name it. It's also where our liquor, household supplies, bottled waters, etc are kept. Which leads me to one of my tips. Keep items close to where you use them- This seems like such a statement of the obvious, but it makes everything so much more convenient and hassle-free when it is right where you need it to be. It also makes it easier to keep the house clutter free because you don't just leave things in a room thinking you will take them back across the house or to the attic or garage, it is all just right there and I can easily pop down and grab something. Get the right tools. My paper products and party supplies were absolutely out of control. Obviously I have a problem with napkins, plates and paper straws. They were all over the place before I got them organized and it lent me to constantly overbuying because I was never sure what I really had. I decided to spend a little money on some shoe boxes at the Container Store and use them to store all of my paper products together. Now everything is grouped together, I can easily see what I have and stuff doesn't get messy. You might need to spend just a little bit of money to buy various bins, baskets and storage containers, but they are absolutely essential in being able to maintain the systems and order that you put in place. I don't want to give away too much of a sneak peek of the closet, because I am going to do two huge reveal posts next month, but I did want to share some of my closet cleaning tips. Group like items together- This really goes for all organizing, as you can see in my basement images where I group all my serving platters together, but it is a fundamental part of creating a good system. In the closet I chose to group items together by color and then by length of sleeve/type of item within the color. You could also do it by grouping different clothing types together- all of your tank tops, then all your short-sleeved shirts, long-sleeved shirts, etc. Invest in good quality, matching hangers. I buy a couple of different hanger types that I use in my closet. I love these clear acrylic hangers because clothes hang so well on them without getting the shoulder dents that wire hangers cause. They also have little indents for you to hang tank top straps in so they don't slip off. I also buy the coated velvet hangers that you can find at places like TJ Maxx and Marshalls because they keep things from slipping off. Whichever type you choose, my biggest piece of advice is to throw out all the wire hangers and mismatch hangers you have. It helps keep your closet neater, keeps your clothes in better shape, and looks 100 times prettier. If you don't love it, don't keep it. This is a super basic principal that is the basis for all purging, but if you do not love something then let it go. I know we might be holding on to those pair of jeans that will fit when we loose 10 pounds. Or keeping something because "you never know when you might need an XYZ", but really all that is doing is taking up space in your closet and in your head and makes getting dressed that much harder each morning. We have been lucky enough to work with The Home Edit on a few spaces in our house, the pantry, Steve's office, old closet and my craft room. We worked together on my pantry first and I will tell you it has pretty much stayed the way they made it for the past several years. There is a reason for that and it is something that they are really big about teaching and implementing in their clients home. Create a system that works for you and stick with it- This really is a fundamental part of organizing and it has been crucial for keeping the pantry looking great. A second component of this is a place for everything and everything in its place. You need to think about how you use your spaces and what is and isn't working for you. It is critical for everything to have a place and for you to know where things belong and to make it easy for you to put them back after you use them. Label, label, label- This is another thing that The Home Edit taught me that is so crucial. Labels are everything. I wish my handwriting was as beautiful as Clea's custom calligraphy, but alas it is not. If you don't have beautiful handwriting, don't be dismayed. Pick up a label maker, basket tags, stick-on labels, whatever you want to make sure that everything is labeled. You never will have to guess what goes where or where something is when everything has a designated spot and is labeled. Cut the cardboard- If at all possible, take things out of the cardboard boxes and packaging. All of that packaging is bulky and takes up a ton of space. It can also be oddly shaped, like packages of flour, sugar, etc, so it is really hard to keep neat. I love putting things in plastic or glass storage containers...with labels of course. Not only does it keep items fresher and better organized, but it looks great too. If you don't have the ability to take everything out of their containers, at least try to corral the different items by grouping like items together.